New York. The swathes of concrete and glass; the vast canyons formed by major streets cutting through the highest of tall towers. This is where dogs and cats are declawed to deal with life inside apartments and population density is amongst the highest in the world, yet there are still pockets of green delight scattered throughout the neighbourhoods of Manhattan. A place where the concept of community gardens took hold decades ago and where small green spaces deliver maximum clout. On our recent trip we revisited favourite places and discovered others. 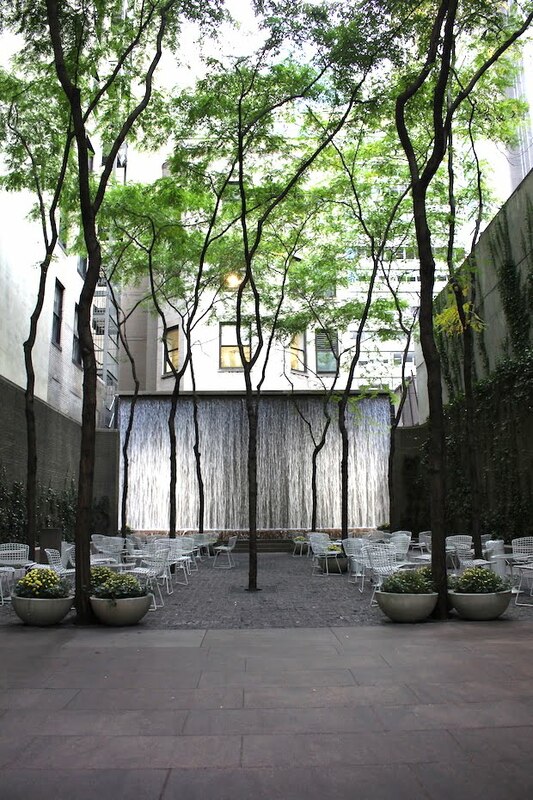 One such small green space is Paley Park. Once the infamous and elitist Stork Club, renowned nightclub for the stars and celebrities in the middle of the last century. 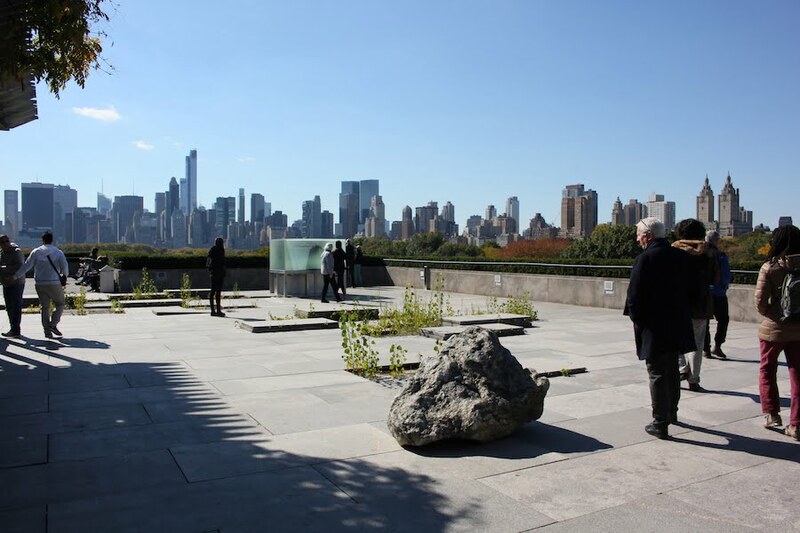 Subsequently it was bought by William Paley, the former head of CBS, who as an act of solidarity with those who were previously unwelcome here, tore the building down and created a park for the public in the empty lot. 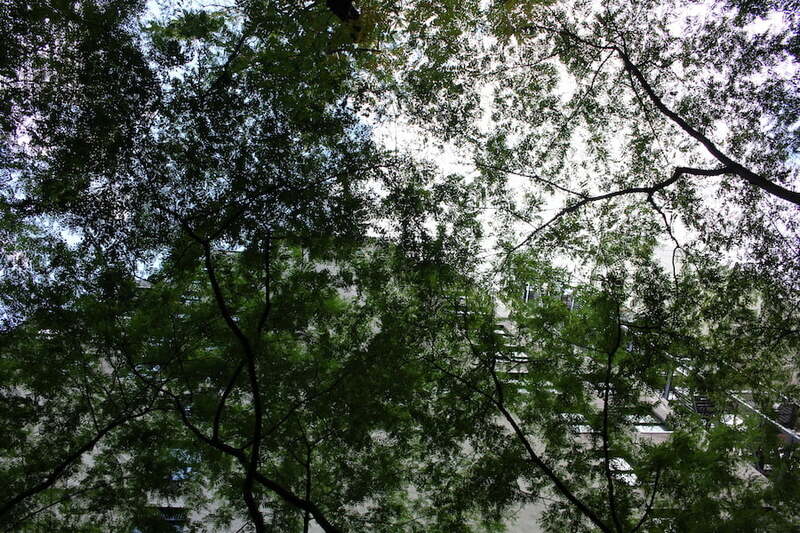 It is a beautiful pause in a street full of high-rise apartments and offices. Just a block away from MOMA and the vibrancy of Fifth Avenue, as you are walking along the street an open space is suddenly revealed. Simply paved with granite blocks, a canopy of mature Gleditsia triacanthos provides a distilled view of the blue sky above, with the backdrop of a curtain of flowing water and ivy clad walls. Imagine the view down from the surrounding apartments? Sitting there you enjoy the quiet, multisensory experience; the sound of the water; the filtered light of the trees; the bird life; the breeze through the leaves. Stylish tables and chairs provide a place to take your coffee or your lunch and to sit serenely, largely screened from the hubbub that reappears as soon as you step outside. It is an extremely civilized and immaculately maintained space, watched over by its gardener attendant, who extends his welcome to all. Onwards into Central Park and how much can be said about this fabulously well planned, extraordinary commitment to open green space. Could we see urban planners doing anything like this in contemporary town planning? 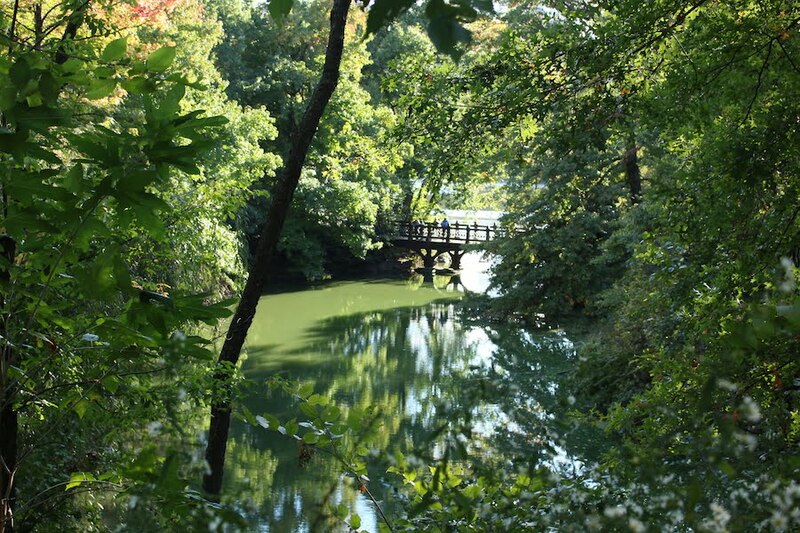 The reservoir, the great expanses of lawn, the Rambles, emergent bedrock, the beautiful bridges, pathways, benches, play spaces and most of all the trees. There is literally something for everyone: whether it is jousting, jogging, performance art; a solitary walk and afternoon nap; a ride in a horse drawn carriage or boating across the lake. Autumn, while late, still showed her finest colours and textures. 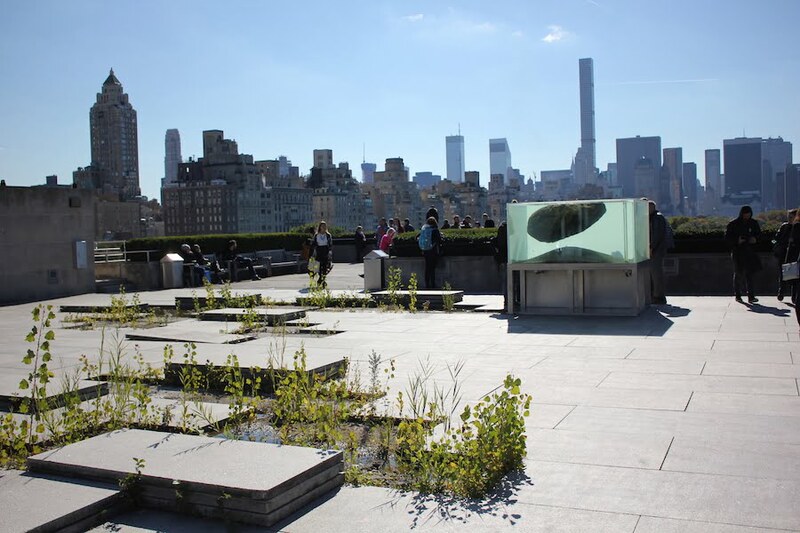 Then up to the roof of the Metropolitan Museum, a spectacular view at any time, looking over the undulating green expanse of the treetops of Central Park. Here the visiting artist, Pierre Huyghe, was commissioned to produce a site-specific piece. He chose to strip the rooftop terrace right back. The granite paving strips were lifted, creating low zones where rain and dust collected, and over time, plants have taken root and sprouted. 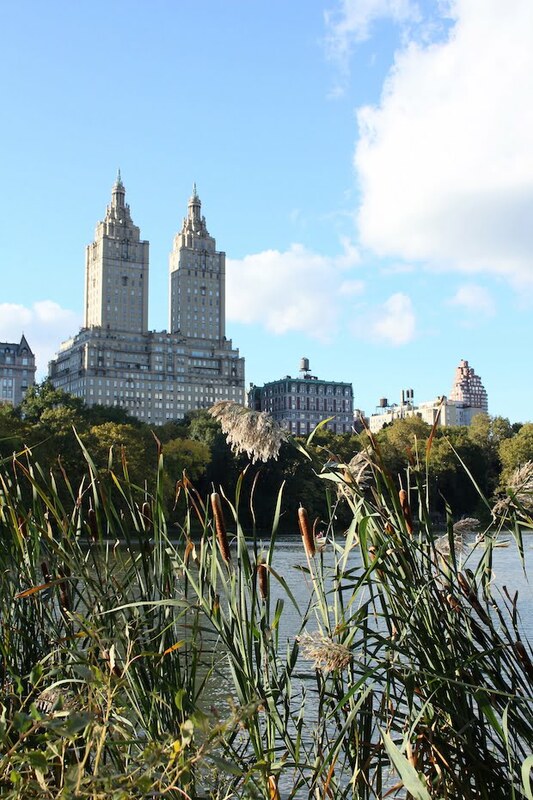 Two pieces of schist, the rock on which Manhattan is anchored, sit in amongst the emergent vegetation and ponds. One sitting on the pavers, the other, suspended in water as if in a fishtank. There are obvious parallels with the High Line and the inspiration of plants spontaneously popping up when conditions become favourable. The installation was a pure demonstration of nature taking over the concrete jungle. 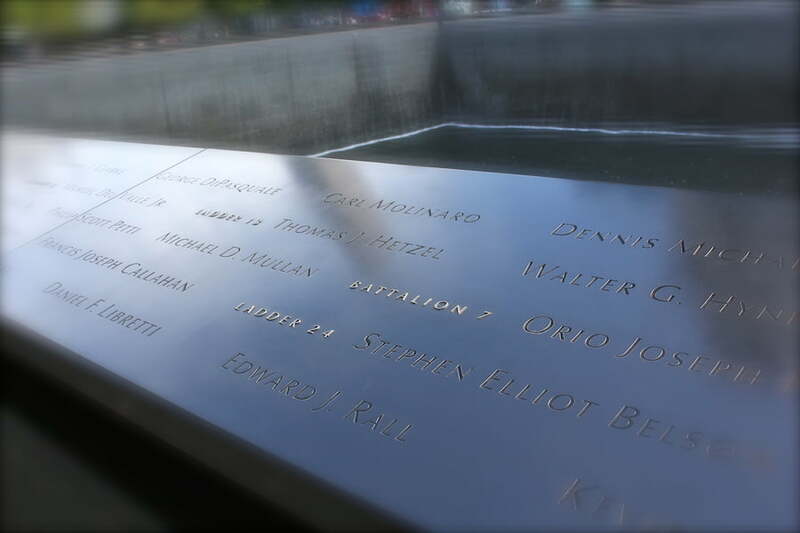 And finally, a visit to the 9/11 Memorial. 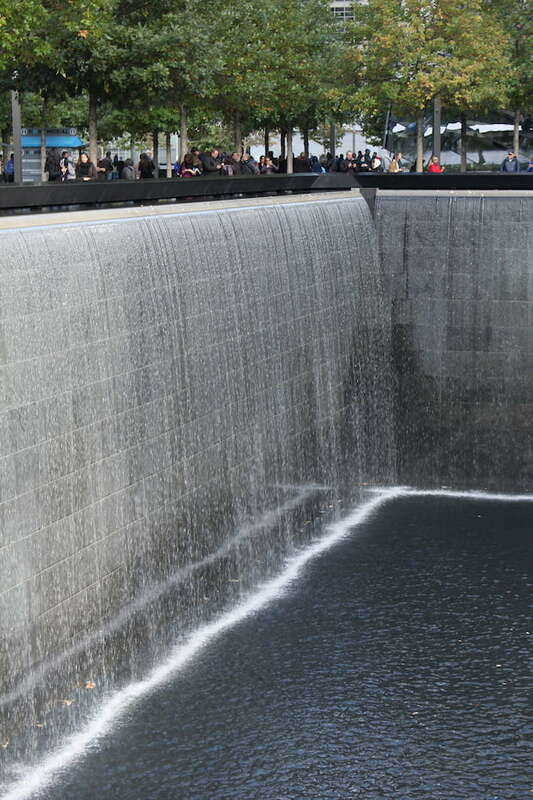 Massive twin pools recall the footprint of the Twin Towers. Each drops away into a void and they are surrounded by a simple grid of trees, lawn and paving. 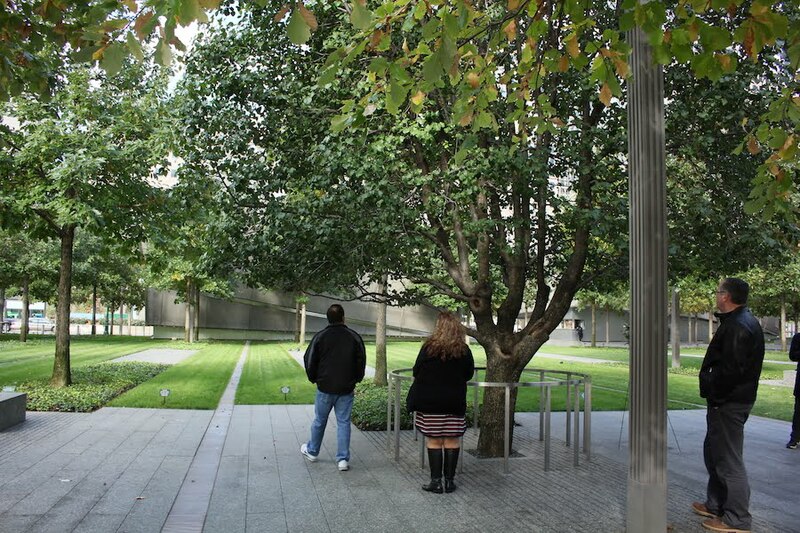 This grid includes the final remnant Ornamental Pear from the original landscaping of the Twin Towers, the whole landscape a peaceful and reflective space. 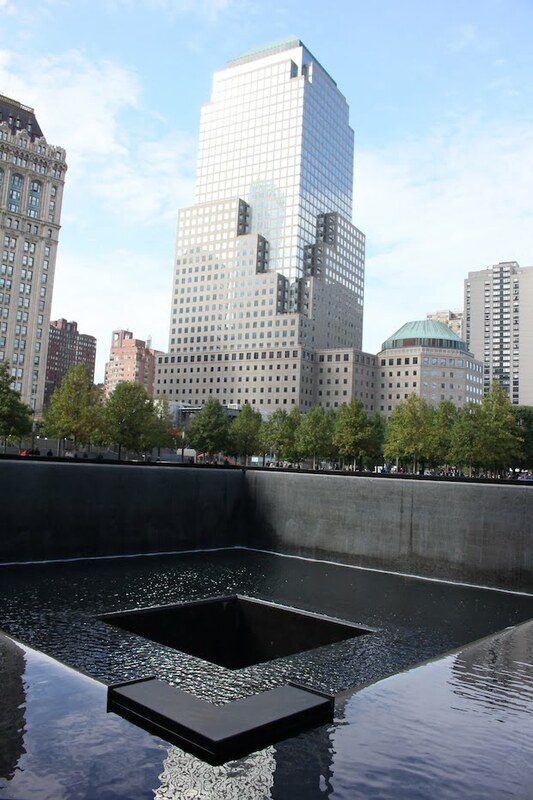 Poignant beyond belief, the wind cuts across the courtyard and catches the cascading water; sending fine drifts of it over visitors as they read the names of the lost, engraved into the granite surround of each pond. 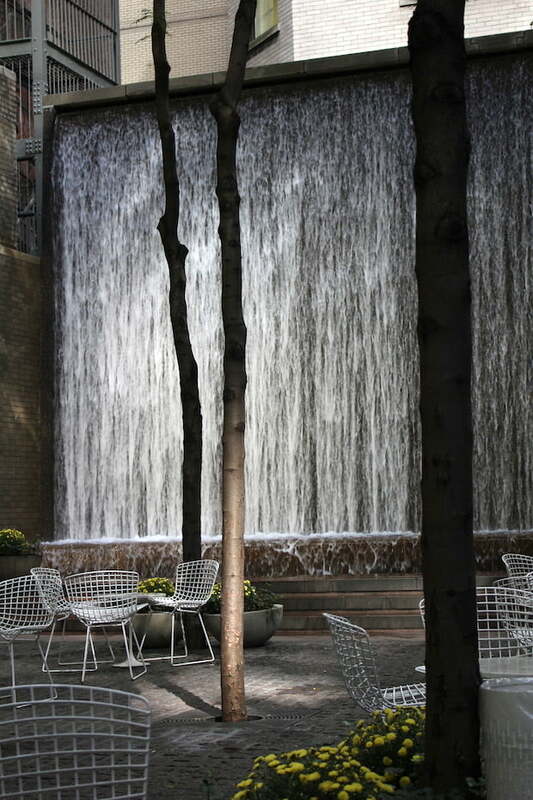 What is it about these four garden spaces that make them so expressive of New York? Of urban and urbane high density living; the transformative events of 9/11; a serene, green escape from a frantically paced life; and the creativity and rebirth emerging from this hub of culture. 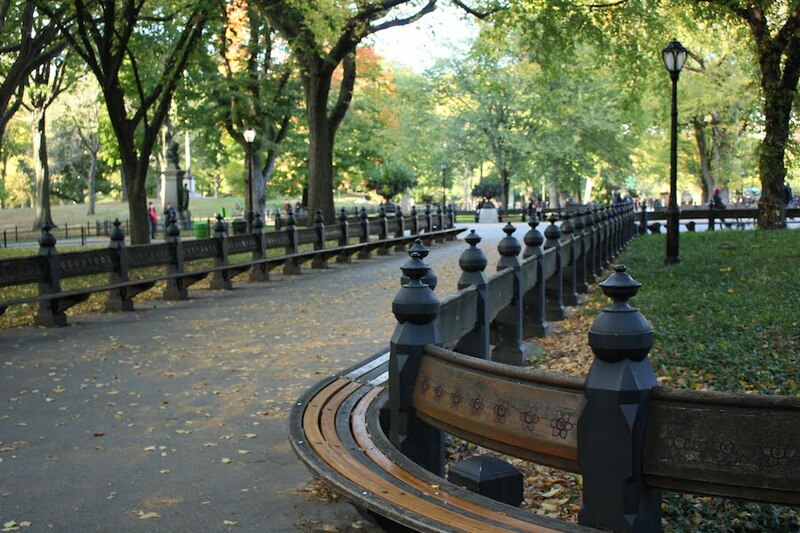 New York is high intensity: selfish, demanding, fast and furious; but within this city lie green spaces that are peaceful, nurturing, reflective, and ultimately, humane. I remember flying out of NYC to Washington the evening before the 9 / 11 attack. The sun was about to set, we flew a wide circle over Manhattan to enjoy the views before leaving the Big Apple – the Twin Towers stood tall and were bathed in golden sunlight, a sight I’ll never forget. The next day all hell broke loose, more than 3,000 people lost their lives, and the world changed forever. 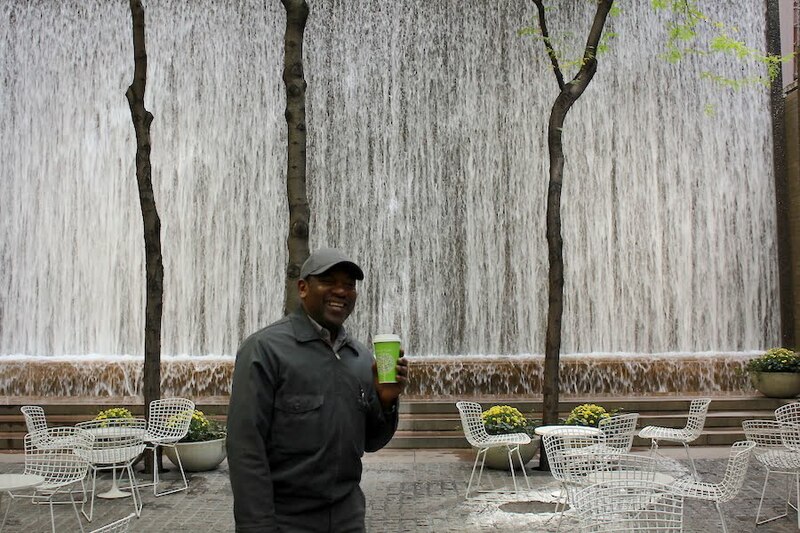 Of all the vegetation around the WTC apparently only one ornamental pear tree survived and has been preserved – probably one of the most important trees in US-American history. 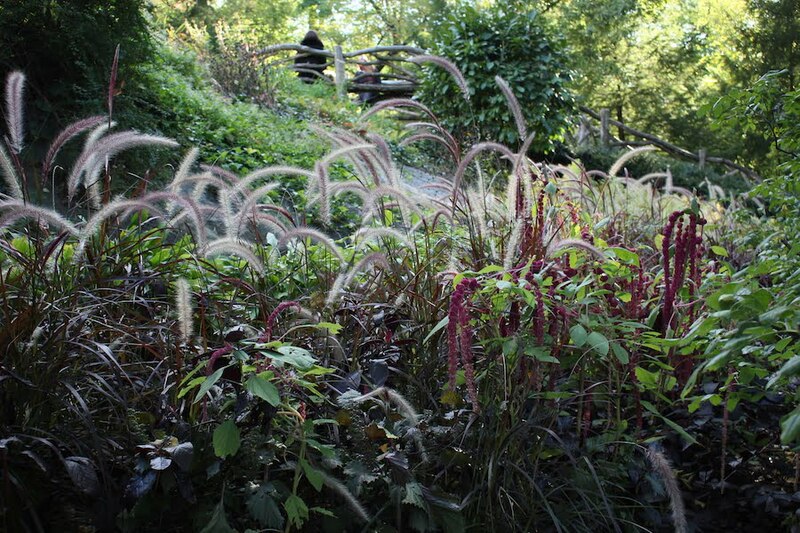 While not endangered it should be propagated and distributed, symbolising the resilience of life in our gardens.